My wife and I both love cooking (and, by extension, eating), so we’re always on the lookout for new recipes and ideas. Kraft New Services provides the iFood Assistant by Kraft to aid seasoned cooks and beginners alike with a mobile shopping list and recipe repository. The app shows some promise, but there are just too many flaws for this to be a very satisfying meal. 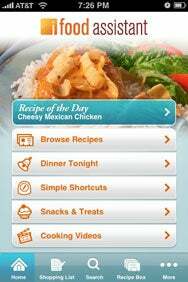 Kraft Work: As you might expect from a recipe app developed by Kraft, there’s a lot of Kraft-branded products on the menu in iFood Assistant. That’s not necessarily a problem, though the poor shopping list feature is. iFood Assistant provides easy on-the-go access to tons of recipes, cooking ideas, and your own custom shopping list. And yes, the app is comprised almost entirely of Kraft-branded food ideas. That’s not a criticism—I didn’t find it a drawback, anyway—but you should expect going in that iFood Assistant has a very Kraft-centric focus. Boasting a layout and design that’s both easy to understand and use, iFood Assistant’s navigation menu system allows you to quickly sort through the sections of the program, even if they do feel slightly cluttered. For example, under “Simple Shortcuts,” you might expect to find tips to make specific tasks easier. Instead, you will find several recipe categories with only a handful of easy, quick items. Many of the items don’t seem to be correctly categorized for searching. There were several items that show up in the list, but aren’t included in search results under their specific category. Further hampering the app’s potential, iFood Assistant provides no way of individually adding ingredients from the recipe view—it’s all or nothing. You might be able to find a great idea for dinner, and you probably already have half of the ingredients needed, but you aren’t able to add just what you need to the shopping list: you can only add all the ingredients from the recipe to your list. The shopping list feature itself suffers from severe limitations. Without the ability to add any items that aren’t included in the app’s database, you’ll wind up having to carry a separate list for everything else you need from the store. Also, adding several recipes that use the same ingredients results in multiple listings of the same ingredient. Your list will show you needing 1 cup of milk, 3 tablespoons of milk, and 2 cups of milk—it’s not a very organized way of handling things. Having your Kraft recipe box with you all the time—at least, whenever you have Internet access—can certainly be handy. But iFood Assistant just has too many drawbacks at this point to be of much use to the home cook. iFood Assistant by Kraft is compatible with any iPhone or iPod touch running the iPhone 2.2 software update.